When is a door not a door? When you turn it into a bookshelf for extra storage space with a secret space behind it! Wouldn’t it be nice to have a secret room? Unfortunately not all of us has that spare room we can turn into a hidden retreat. But that doesn’t mean you can’t have a secret place in your house. This project shows you how you can turn an ordinary closet into a secret storage area. 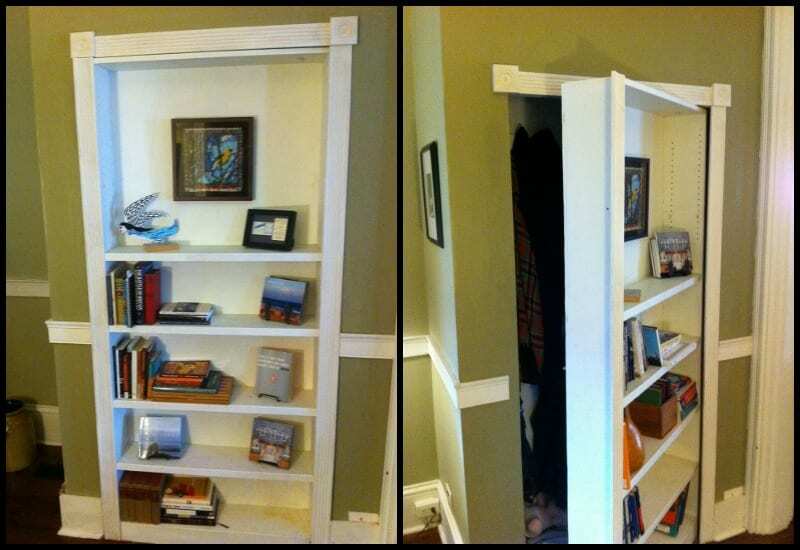 You can turn your closet into a secret space by turning its door into a bookshelf. You can use this hidden space for storage. And if there’s enough room, you can turn it into a personal retreat, or use it as a panic room. And the bookshelf door still functions like any other bookshelf, able to hold your book collection. The best part is that you don’t have to spend a lot of money to build this project. 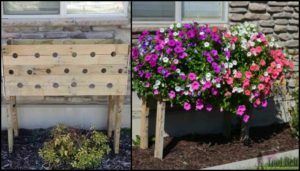 Everything is customized and made from inexpensive materials you can easily buy in your local hardware store. If you have a secret room, what would you use it for? I begin by making a door frame to the exact measurements of my brothers closet. The dimensions of the finished door came out to be 34″ wide, 77″ tall and 8″ deep. I assume if you are building this project you have enough wood working skills to make a bookshelf and your sizing will vary so I won’t go into detail about that. 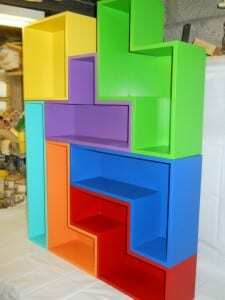 The door is a solid bookcase made from 3/4 smooth plywood and 1/2″ regular plywood for the back. Glued and screwed on all sides. 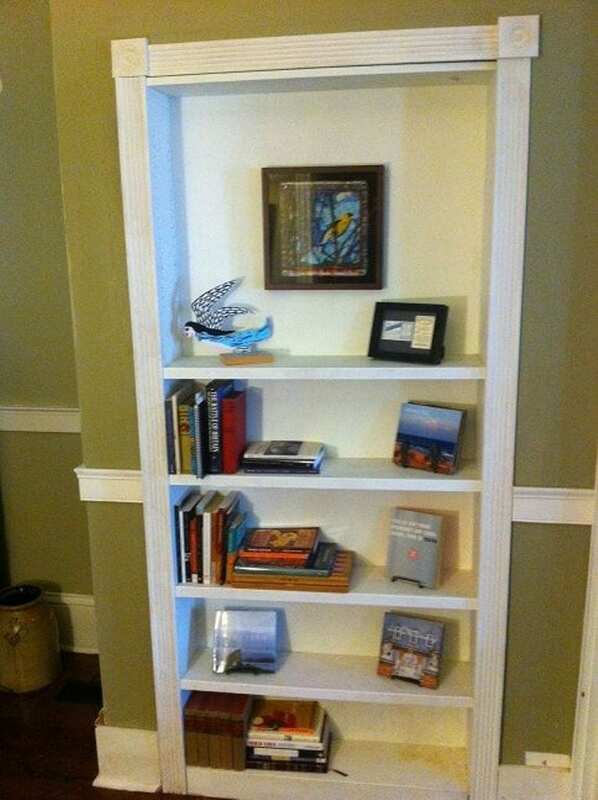 There are five attached shelves and adjustable shelf holes drilled at the top. I made a template to help drill the holes all the correct width and height. One of the hardest parts was the hinge point. I used a lazy susan on some 2×4 blocks for the bottom and a long bolt for the top. It took a lot of measuring and testing to get it centered right. Adequate spacing was needed on the hinge side to just barely clear the door frame and still be covered by trim. Most commercial doors have steel frames and don’t need caster wheels. Due to the weight of the shelves and contents we added a 6 inch rubber wheel, installed a little bit high and hidden with fake books. It does not hit the floor. Installation involved removing the closet door and trim. Screwing in some wood blocks to the inside wall that would accept the top hinge bolt. Once the door was in place, I tested the opening many times and then secured the base with 4″ screws. The latch bolt was installed to the interior door frame matching the latch height. A fishing line was secured and run through the back of the door and connected to the secret book opener. Hindsight note: Double or triple knot that fishing line or it might come off and your door is stuck closed. The secret door opening book was a really nice touch supplied by my brother. I glued the pages together to make a solid area for attaching a small brass hinge and fishing line to pull open the latch. My brother finished painting and loading with books and decorations. I think it turned out really nice and I’m told it’s a great conversation piece when company comes over and he puts their coats away. A closet for guests’ coats, pantry or a personal retreat – there are several options for your secret room while providing an extra bookcase or display shelf for your home. But this project is perfect for those who have plenty of confidential and treasured belongings that needs good hiding. If you plan to transform your room into this purpose, then this would have to be a secret project! The secret book is a good latch idea. Can you think of any other item for it? Thanks to Stryker for this great project. 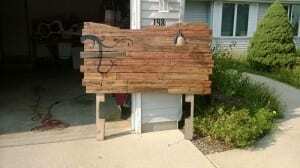 Next PostBuild your own Dutch barn door!